Handel was 63 years old when he composed Solomon, one of his final masterpieces. This monumental oratorio depicts the three highpoints of the biblical king's life: the building of the temple, the famous judgment, and the visit of the Queen of Sheba. With a dramatic instinct keener than ever, the composer did not hesitate to combine political and patriotic reflections with exaltation of carnal love and celebration of earthly riches. The sinfonia from act III, commonly known as “Arrival of the Queen of Sheba”, has become one of the the world's best-loved classics. It is perfect for any event, wedding or celebration, and a fun piece to play at a recital. The opening sinfonia is of unusual scope for Handel's oratorios. It has even been suggested that this piece was not actually composed for the work at hand, but rather was borrowed from another unfinished project. In its original form, the piece is scored for two oboes and strings. 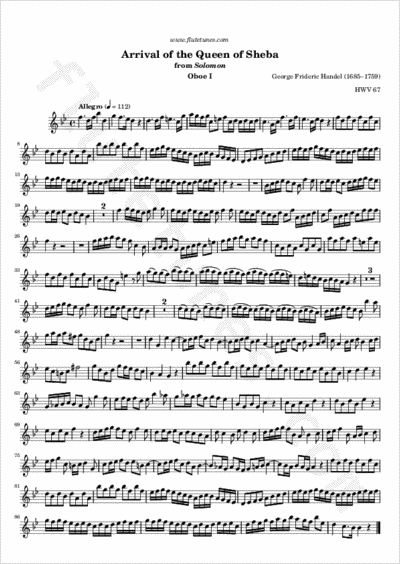 In our arrangement, you can choose to play the part of the first oboe with the provided string accompaniment, or you can play the piece as a duet with a friend. As a fun exercise, it's also interesting to try out the violin part, which carries the famous initial theme!